Consider a scenario in which you're trying to do the right thing by ensuring that authenticated SMTP client connections to your Exchange server are protected by TLS encryption. Most commonly this will be when you have IMAP or POP clients configured with the Exchange server (or a DNS alias that points to the Exchange server) as the SMTP server for sending email. The outgoing server (SMTP) mail.exchangeserverpro.net does not support the selected authentication method. After Googling around you learn that your SMTP client should use STARTTLS in order to authenticate securely. Here's an example of how that is configured in Mozilla Thunderbird's outgoing server settings. Notice also the use of port 587. Exchange servers are pre-configured by setup with a receive connector that is designed for use by SMTP clients, named “SERVERNAMEClient Frontend SERVERNAME”. This is the port and connector that you should be using for your authenticated SMTP clients. When you next attempt to send an email you get a different error. Depending on the email client you may get a certificate trust warning, a prompt to add a security exception to trust the untrusted certificate, or it may just fail completely with a certificate error. In all cases, clearly something is still not right. The solution here is in the configuration of the receive connector that authenticated SMTP clients will be connecting to. Even though you have enabled a valid SSL certificate for SMTP, the connector needs to be configured with the “TLS certificate name” that you want to use. The first time I ran into this problem I found lots of articles and blog posts telling me that was the solution, but none of them told me how to actually configure that. And if you look at the Set-ReceiveConnector documentation, you still get confusing (and wrong) advice. The above would probably be more useful if it provided an example, but more importantly, the “[I]” and “[S]” are not correct. If you try to use them, your Set-ReceiveConnector command will fail. Here's an example of using the correct syntax for TlsCertificateName. First, determine the thumbnail value for the certificate you want to use. In this example I'm going to use my wildcard certificate, which is already enabled for SMTP. Repeat that for every server and connector that will be handling the authenticated SMTP connections, i.e. if you're using a load balanced SMTP namespace. Your SMTP clients should now be able to securely authenticate without any warnings or errors appearing. Thanks for tracking this down. Looks like the MS documentation needs a little work. Once the cert was configured I got a error “530 5.7.1 Client was not authenticated” even though both Outlook and Thunderbird are configured for SMTP user authentication. I can get a success by enabling Anonymous Users” permissions but won’t because it is a very bad idea. Following https://community.office365.com/en-us/f/148/t/176699 led me to explicitly add the mailbox user to the Send As list on the same user through ECP to fix it. I’m not sure why that was required but there you go. I also didn’t have to include the NETBIOS domain name with the user ID. this also fixed a STARTTLS issue with a front end connector at one of our clients. A valid cert was in place for SMTP but STARTTLS would not initiate. this procedure cured cracked it. Now responding to STARTTLS. could you please explain how did you achieve this? Thanks Paul. Great post ! It seems so shortsighted that Microsoft would create a GUI and cmdlets to set a certificate, but then overlook a component that is so critical to have the cert applied. This fixed my issue, and it was only after many hours of searching! I knew it was using the wrong cert I just didn’t understand WHY. Helped me much after looong nights ans days scrumbling with this headache ! Would i need to make this change for all receive connectors on Exchange 2013 server? Sorted – selected the Default Frontend connector and logs have stopped! Once again your site has solved a problem that was driving me crazy after deploying a Ex2016 server to accept inbound email. Thank you. I have been struggling to get STARTLS working with Exchange 2013 and Mimecast. I was puzzeled on why Exchange kept presenting a self signed cert that was not even assigned to SMTP service instead of the wildcard cert. With new version of your page there is bug in command ‘[PS] C:>$tlscertificatename = “<i>$($cert.Issuer)<s>$($cert.Subject)” ‘. As you know, it should be ‘[PS] C:>$tlscertificatename = “$($cert.Issuer)$($cert.Subject)” ‘. Lol, comment got really messed up. Anyway, you know what to do. once again you rocked the Exchange – Thank you very much for this guide (and all the others) – Much appreciated. “A positional parameter cannot be found that accepts this agrument ‘-TlsCertificateName’. Looking up Set-ReceiveConnector with Get-Help does not show a parameter available called TlsCertificateName. Is there another way to associate a certificate with a receive connector? My question is why doesn’t the normal certificate enablement process just do this by default? IMHO, it’s a bug that Exchange 2013/2016 don’t use the certificate explicitly enabled for assigned services and continue to leave default self-signed certificates assigned and in use by SMTP and IIS (back-end port 444 binding). Enabling a certificate for a named service (SMTP, IIS, POP, IMAP) should by default make it the active certificate in use. 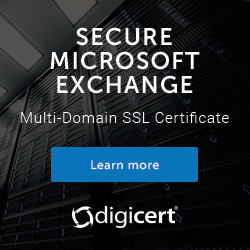 I appreciate that MS may be trying to ensure STARTTLS availability and back-end SSL use out of the box for connections where certificate trust are less of an issue. And it’s great that TLS certificate assignment is possible to specific connectors for unusual corner cases where unique names/certificates are assigned on a per connector basis. But it’s bad and nonsensical to install default certificates and leave them active after PKI certs have been installed and enabled for the assignable high level services. My understanding is that SMTP is a little different because it needs to cater for both server to server communications (servers address each other by their real names, and the self-signed certs are used for TLS) and client to server communications, as well as other scenarios like hybrid mail flow, partner connections, and so on, that all might use different certificates and namespaces. Is there any solution to get this working on Exchange 2010 SP3 ? I get the same error as Joshua. Please let me know the best way to achieve this ? Having issues with 2010 sp3 as well, going by the article you linked – if you change the FQDN to match the name of the external cert, it should then use that cert for SMTP rather than the self signed? If not that simple, is there another way of achieving the same outcome? Once again Paul saves my bacon. Thanks! Hi Paul, do any services need to be restarted after doing this? I implemented on Exchange 2016 for the “default frontend” connector for both servers and it is still happening. I don’t think I needed to restart anything. If you suspect a service restart might be necessary you can try restarting the transport services on your server. I am setting up a hybrid office 365 with a third party email filtration (proofpoint). MX points to proofpoint and office365 is authorized as a receiving and sending server. Mail flow to office365 Mailboxes works fine, but mail flow to the on-premises mailbox is deferred with below error. Later on, emails may get released from office365 queue to the on premise MB when office365 forwards the email to proofpoint MX records! I do have a valid SSL certificate. Does mail.mydomain.com resolve in DNS to your on-premises Exchange server(s)? You might have a connector conflict. Check your receive connectors on the servers that should be receiving the O365 mail flow. Turn on protocol logging for each of them, and then review the logs to see which connector is trying to handle the incoming connection from EXO. Also check that any firewalls are not trying to do SMTP inspection. I did exactly what is on your blog, but in my case it did not work. It continues to present a prompt with my certificate, which in the case is a wildcard. My certificate is a * .domain.com and the FQDN name of the Connector is mail.domain.com. What does the prompt say? Hi Paul, We have a scenario where we have two certificates installed on Exchange (one that is expiring and one that has just been issued) and both those certs have the same Issuer and Subject name. Will this process ensure a specific certificate is definitely used (via the Thumbprint) or does Exchange just look at the Issuer / Subject name to match things up. Good question, and I’m not 100% sure, but last time I updated my Exchange certs I didn’t need to reset the TLS config on the receive connector, it just kept working, so I suspect that if the issuer and subject are the same it will just keep working. I have issued the Enable command with my Cert from GODADDY CA assigned it to SMTP confirmed it stated to overwrite, performed the change on the receive connectors, and alass nothing. Which receive connector did you configure? I configured my Client Frontend Receive Connector to use my external certificate which is associated to IMAP. When I configure Outlook to use IMAP for Outbound, using SMTP Port 587 for (With TLS or without TLS) it works correctly. But when I configure Mobile Devices (Android/iOS) to use IMAP for Outbound, using SMTP Port 587, it only works with TLS. It is not possible to use without TLS. We have an edge transport configuration, for our Exchange hybrid deployment. The edge servers are used only for hybrid mail. They are subscribed via edgesync to our Exchange site. I found that the tlscertificatename setting, when set to “cn=name,o=org,c=locationcn=name,o=org,c=location” would cause my send connector to stop synchronising over to the Edge server. If i set the TLScertificatename $null it would synchronise correctly. I ended up having to set tlscertificatename to only “edge.company.com” only and left the rest off. O365 is happy, and my edge subscription is synchronising correctly. Hope this helps someone in the future, or perhaps some insight into other issues for someone else. Ok apparently and cause italics and strikethrough. here’s what my comment was supposed to say. The two fields have “” added to prevent the formatting. Is there anyway to revert these changes outside of powershell? Exchange management shell no longer connecting, nor can I log into the Exchange Administrative Center. Failed to connect to an Exchange server int he current site. nmap -script ssl-cert is showing same certificates as it was before changes were made. If all you changed was the TLS certificate name on a receive connector then that should have had no impact on PS or the EAC. If you think the HTTPS certificate binding is the problem then you can look at that through IIS management console as well. Thanks so much for this article. I thought SCHANNEL “A fatal alert was received from the remote endpoint. The TLS protocol defined fatal alert code is 46” polluting the event log was just something I had to live with. hi paul we have configured tls certificate for our receive connector. however due to no internet connectivity on my exchange server we are getting revocation check failure and seems due to same reason our application could not able to send mails over 587 tls. mail does not go without confirming certificate validation. how can we resolve revocationcheckfailure without internet connection. I don’t know. Probably best to allow certificate revocation checks instead. That’s pretty important. From start till now I have been following all of your guide here. But for today I just have to leave a comment because this guide was superb. Been search for 2days now for the problem connecting smtp client. Looking forward to more guide and tutorial. You rock! Thank you very much! Good day! Glad you found it useful Chi. Hi Paul – Is there any way of undoing the -TlsCertificateName change/reverting back to null? I am having the dreaded “A fatal alert was received from the remote endpoint. The TLS protocol defined fatal alert code is 46” error on an Exchange 2016 server in a DAG. I followed the directions above and now have a TlsCertificateName in the receive connector properties. I have also done a packet capture for the time frame the error occurs but an not sure what to look for. Any suggestions would be greatly appreciated. Thanks so much for all your articles and assistance. I’ve been on a deep-dive trying to troubleshoot my Exchange 2013 server for the last couple days. It takes a long time (hours, half a day in some cases) for a 20MB email to come inbound after a number of retries by Mimecast. I also have the schannel issue, and as one person above mentioned, I thought I had to live with it too. Well I applied your fix and the schannel errors stopped. We’ll see if it has any effect on the slow large-email delivery but I’m willing to try almost anything at this point! As you stated a lot of sites saying what the problem was, but thankfully you took the time to provide the solution.